Thomas Jefferson, the third President of the United States of America, was one of the most intriguing figures of his era. Writer of the Declaration of Independence, he played a crucial role in early American history. As president, he was involved with the Louisiana Purchase of 1803 and the Lewis and Clark Expedition. A man of the Enlightenment, Jefferson was astoundingly intelligent, functioning as a polymath with talents as a horticulturist, politician, lawyer, architect, archaeologist, paleontologist, and inventor. Despite all of his accolades, he was a very mysterious man. The information we have about him reveals him to be a man of incredible contradictions. Frequently cited as one of the greatest American presidents who ever lived, he is both a hero and an enigma in American history. So let’s take a look at ten interesting facts concerning this great, and unusual, man. 10. Thomas Jefferson has a unique tombstone for a president. Thomas Jefferson’s tombstone makes no mention of his service as President of the United States. Jefferson was buried at Monticello, his hilltop mansion. His epitaph reads: “Here was buried Thomas Jefferson, Author of the Declaration of American Independence, of the Statute of Virginia for Religious Freedom, and Father of the University of Virginia.” It is reported that there is no mention of his presidency because he had such mixed feelings concerning politics. 9. Thomas Jefferson was the only two term president who never vetoed a bill. Although his predecessor John Adams was the first president who never exercised the executive power of veto, Jefferson was the first two term president who never used it. Compare this to Washington who used the power of veto twice and Jefferson’s successor James Madison who used it seven times. It is accepted that he never vetoed a bill because he believed that the chief executive should play a limited, caretaking role in the government. 8. Thomas Jefferson was a terrible public speaker. Despite his skills at writing and conversation, Jefferson was never a very competent public speaker. When he had to speak publicly, he frequently mumbled and spoke in an inaudible voice that made it very difficult for people to hear him. That’s not to say that his speeches were not well written and meaningful. He just wasn’t able to give them in front of crowds. John Adams once said, “During the whole time I sat with him in Congress, I never heard him utter three sentences together.” His fear of public speaking made him an incredibly private president who tried to avoid the spotlight. For this reason, he started the tradition of sending the State of the Union message to Congress in writing so he would not have to present it. This tradition was followed until 1913 when it was broken by Woodrow Wilson. 7. Jefferson was subjected to one of the worst smear campaigns in presidential history when he first ran for office. 6. Thomas Jefferson was very religious. Jefferson was a religious man but his beliefs caused controversy. He was raised as an Anglican, but grew up to be an opponent of all organized religion. Jefferson was actually a very spiritual person who believed in God and the moral teachings of Jesus Christ, even compiling and translating his own version of Jesus’ teachings. The controversy surrounding Jefferson probably comes from the fact that he did not believe that Jesus Christ was divine. 5. Thomas Jefferson was a very casual person. He had very bad posture and had a tendency to wear clothes that many felt were unfitting for a man of his stature. He usually wore a worn brown coat, red waistcoat, corduroy breeches, wool hose, and a pair of carpet slippers without heels. He almost sparked an international incident when he accidentally insulted the British ambassador by received him while wearing informal clothes. He also started the presidential tradition of shaking hands with visitors instead of bowing. 4. Thomas Jefferson loved wine. Jefferson was one of the preeminent wine connoisseurs of his age. His home, Monticello, had an enormous wine cellar that was 17 ½ feet long, 15 feet wide, and 10 feet high. Jefferson always had copious amounts of wine and other liquor at hand. Even today, bottles of wine that are associated with him are able to fetch hundreds of thousands of dollars at auctions. Jefferson was also the partner of Philip Mazzei, an Italian immigrant, who set up the first commercial vineyard venture in America. During his eight years as president, he ran up a personal wine bill of $10, 835.90. Adjusted for inflation, that translates to $146,524.40, or $18,315.55 for every year in office. Jefferson’s wine collection (and wine drinking) was one of the reasons why Jefferson was always in debt. 3. Thomas Jefferson was a talented musician. Jefferson was a very gifted violin player. During his early life, he practiced playing the violin for hours every afternoon. He also loved to sing and would frequently sing or hum to himself under his breath. His days as a violin player ended in 1786 when he broke his wrist trying to impress a woman. His wrist never fully healed afterwards. 2. While Thomas Jefferson was a staunch supporter of the freedom of religion, he advocated the separation of church and state. 1. Thomas Jefferson was publicly opposed to slavery. 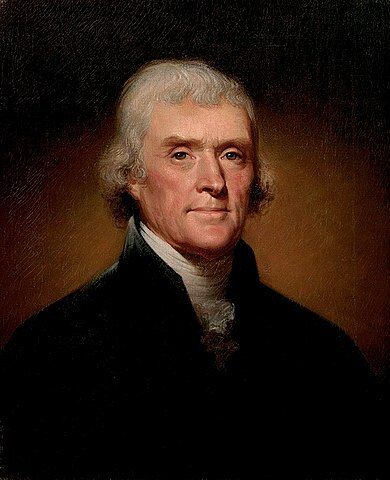 Despite the fact that Thomas Jefferson owned slaves for his entire life and had an affair with his slave Sally Hemings (a relationship that resulted in five children), he was against the institution. When he represented Virginia at that Continental Congress of 1783, he proposed a bill that would outlaw slavery in all new territories acquired by the federal government. Sadly, his proposal was defeated by one vote. In his first draft of the Declaration of Independence, he included a stinging rebuke of Great Britain for its sponsorship of the slave trade. This was later dropped at the request of South Carolina and Georgia. In 1807, he signed a bill that abolished the slave trade. It is believed that the reason that Jefferson had slaves was because he was always in great debt. He had encumbered his slaves by notes and mortgages, making him unable to free them until he had paid back his debt, something which never happened. However, he did free several of his slaves before his death. He and John Adams both died on the same day: July 4, 1826, the 50th anniversary of the signing of the Declaration of Independence. Although they often had differing political opinions, they remained lifelong friends right up to the very end. that is right and I am 10 so. Wow. I'm certainly glad we've come a long way of accusing presidents of . . . oh, wait. very informative and presented in very interesting manner. Good work. Aw, thank you. I always appreciate the feedback. Although Jefferson was probably not a true Christian (not believing Christ is the Savior), I still believe the term Separation of church and state is today misinterpreted. In his letter I believe his point was to make sure they knew the USA would have no official religion. The term Separation of church and state was not to keep religion out of the government , but the opposite. It was to prevent the government from interfering with any religion. As far as I know all of the founding fathers never intended to take God out of the government like our leaders have done today. Therefore the term S of C and S is completely misrepresented. Can you find any supporting evidence in favor of your “interpretation”? Thank you for # 2.
see that America. A seperation of church and state. Stop melding the two together. I think calling someone “very religious” is a vacuous term – certainly not worthy of a “fact”. “Religious” is a term like “sports” it doesn’t tell you anything specific about what someone actually does or believes. Remember, at that time some of the States had State Religion. Regarding Mr. Jefferson’s posture, in the Ken Burns; film, a description attributed to one of his slaves recalls quite the opposite. What are your sources? that was not fare about him owning a slave. he could and by he I mean the slave could have got hurt. and most likely invented the ‘swivel chair’ (chair that can spin around or at least swivel from side to side).